At Corona Contracts, we work with clients across a large range of industries and office environments supplying executive blinds systems build for years of trouble free commercial performance. Executive offices and boardrooms are spaces where important decisions are made and critical meetings are held. As such, they should echo a company’s core values. As we have worked with many large organisations over the years, we offer an executive blinds services for offices and boardrooms. Bespoke designs, manufactured to spec with fitting service included, all catered specifically for this niche. As all of our installations are bespoke, they can be perfectly tailored to any space. We can even work with your architects or interior designers to help you achieve exactly the look you want. 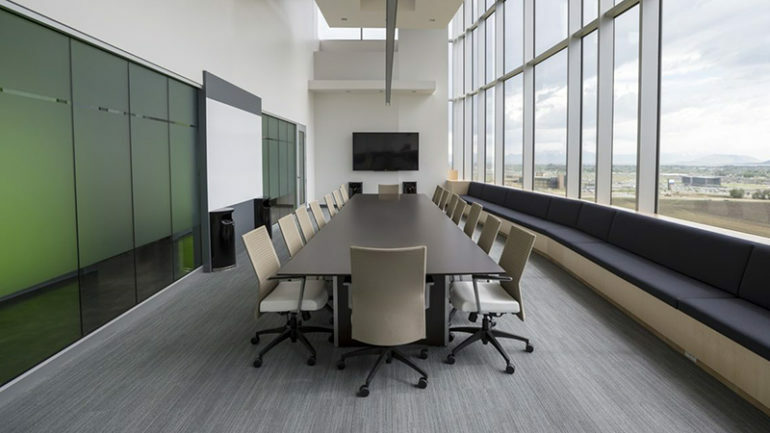 Our advanced systems work well in spaces of all sizes, so whether you need to fit out a giant board room with floor to ceiling windows, or a reserved private executive area, we can craft the perfect blinds for you. Since all of our products are made in-house, we can assure you of the best possible quality and value. We carry out all installations ourselves for the cleanest, most impeccable finish because we understand our clients want only the best for their money. We manufacture a huge range of styles which we craft to your unique needs. From matching company colours, to displaying logos or slogans, we can create it all at our in-house facility in Preston where we print bespoke designs onto a vast range of fabrics, including blackout blinds. The components we use in our blinds systems are of the highest quality, imported from industry leaders Mottura, an Italian company with an outstanding reputation. Our executive blinds systems can include motorised systems to remotely and automatically control light a privacy in your works spaces. These offer several benefits, not least in terms of convenience. They come into their own in particularly large boardrooms or areas where access to windows may be restricted. The ability to completely control the lighting in the room at a touch of a button comes into it own when making presentations, especially if a projector is being used. As we control the entire process of design, manufacture and installation, you can be absolutely sure that you will enjoy the highest quality blinds in your office suite, boardroom or complex. Everything we create is built to last, meaning lower maintenance costs and maximum uptime for your business. In the highly unlikely event that anything goes wrong, our existing customers will testify we offer industry-leading aftercare services to all of our clients. Getting in touch with Corona Contracts could not be easier. Simply reach out to us through our website or give us a call to discuss your needs. Having worked with many busy and in-demand businesses, we understand that it is critical that daily operation is not disturbed. To this end we provide our services at times that suit your business and work quickly and quietly so as to create absolutely minimal disruption to you and your team. Our polite and punctual installation engineers always clean up after their work is complete and follow all appropriate risk assessments and health and safety precautions. If our executive office and boardroom blinds service could benefit your business then speak with the team today and discover the benefits of Corona Contracts’ bespoke blinds systems.